Catholic In the Chaos: My Journey Veiling at Mass: Part 1! Note: The Catholic Church's stance on head covering is that it is not required but is permitted as a personal devotion. This series of posts is not suggesting it is required in any way and is only my personal experience with head covering. 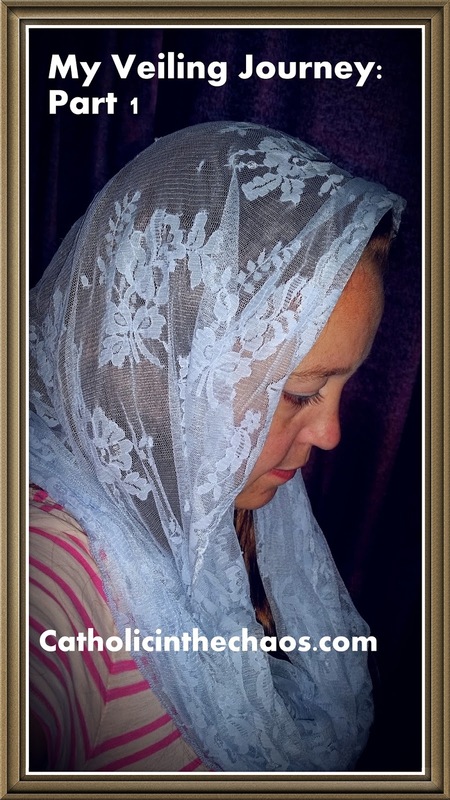 If you read my book review on The Chapel Veil: Symbol of the Spouse of Christ than you have already heard a little bit about my journey to veil at Mass. Here is the unabridged version. I have a few scattered memories of my grandmother placing a scarf over her head when she entered a Catholic church many many years ago. I was very small and did not seem to understand why she did this nor did it occur to me to ask. Therefore, I suppose it makes sense that I didn't seem to truly notice when or why she stopped donning her head with a cover at Mass. Yet, for some reason, it ceased. In that time since, I have been inundated with the classic falsehood that "the church" no longer requires veiling or head coverings because they no longer see women as submissive to men. Therefore, when I went to Catholic elementary school, I was not introduced to this tradition. As I grew up, I never really thought about veiling. I saw pictures and video of women from other countries covering their heads when participating in Papal Masses but never thought about why they continued to do so, or why we in America did not. It wasn't until I moved to the parish I am now currently a parishioner, did I come face to face with veiling once again. I noticed it immediately when I walked into this church our first Sunday there. One lonely woman, with a veil, seated up front. The next week I saw two women with veils, then three, scattered around the church. My, aren't we "holier than thou"! How they must think themselves so very "holy" compared to the rest of us women who attend with bare heads (cue eye roll)! Yet I was strangely drawn to them. For reasons still unknown to me, and in which I chalk up to an interior calling of the Holy Spirit, I had to watch these women in church. I couldn't take my eyes off of them. They dressed modestly, mostly in skirts and dresses knee-length or longer. They bowed or genuflected reverently prior to receiving the Blessed Eucharist and they seemed to be in their own little world, as if not distracted by all the sounds and sights I seemed to be during Mass. What was it about these veils and why am I so drawn to them? I had to ask myself. Once I noticed these women, those scattered memories of my early childhood vaguely came back to me. This was introduction to veiling as an adult. 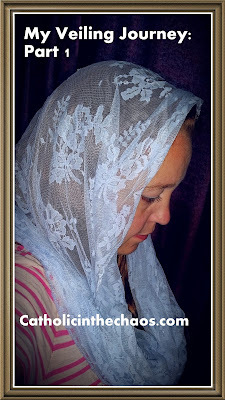 Now what was I going to do with this...this veiling thing?